‘Hébert is the first Canadian Francophone chess player to establish a solid international reputation, by playing in the 1979 Interzonal, and with his seven chess Olympiad appearances, earning a bronze medal in 1982. He was the first Francophone Canadian Chess Championship winner since 1884, and only the second ever. He is also the first Canadian Francophone to earn the correspondence Grandmaster title, and is one of the few players to achieve international titles at both over-the-board and correspondence chess. 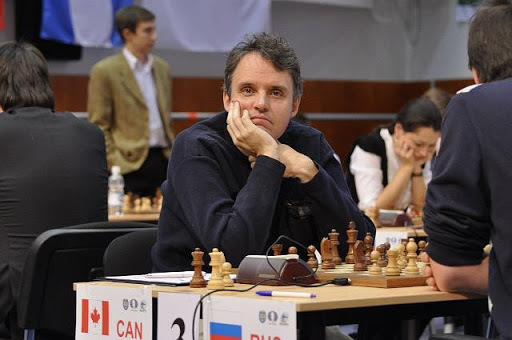 Hébert has been a respected commentator at major chess matches and events, such as the 1989 Quebec City Candidates’ encounter between Kevin Spraggett and Artur Yusupov. He served as Editor for the magazine Echecs+, published by the Quebec Chess Federation. He was the chess columnist for La Presse (Canada), has written articles for New In Chess, and published the magazine Au Nom du Roi, which has since been replaced by his own online newsletter. He served for a time as a columnist and games analyst with Chess Canada magazine, writing as lucidly and incisively in English as he does in his native French. Hébert was inducted into the Canadian Chess Hall of Fame in 2001. Here is a win over a strong Hungarian GM. White had been in some trouble but now gets a chance to turn to the attack. How should white continue?